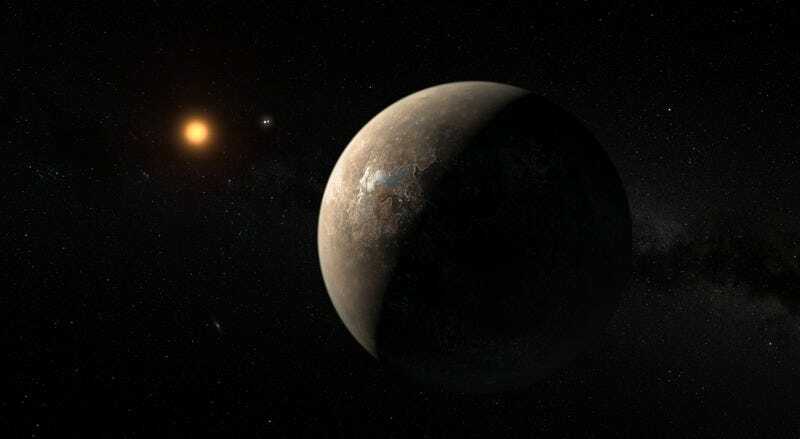 In what’s being hailed as one of the biggest astronomical discoveries of the century, scientists with the European Southern Observatory (ESO) today confirmed the discovery of an Earth-like exoplanet in the habitable zone of Proxima Centauri—our nearest neighboring star. Details of the team’s discovery were just published in Nature. Now we know those rumors were true: There is clear evidence for a planet orbiting Proxima Centauri, a small red dwarf star located just 4.25 light years away, slightly closer to Earth than the famous binary pair of Alpha Centauri A and B. It’s been dubbed Proxima b, and the ESO team pegs its mass as being roughly 1.3 times that of Earth. Its orbit is 4.3 million miles from Proxima Centauri, just 5 percent of the distance between Earth and our own Sun. But the star is also much cooler than our Sun, so Proxima b still lies within the so-called “habitable zone” for exoplanets, with temperatures sufficient for water to be in a liquid state on the surface. Since the first exoplanet was discovered in 1995, astronomers have identified more than 3000 such bodies orbiting distant stars. “We live in a universe that is teeming with terrestrial planets,” Pedro Amado of the Instituto de Astrofisica de Andalalucia said during a press conference this morning. Red dwarf stars like Proxima Centauri in particular are believed to be rife with small, rocky Earth-sized planets. According to lead author and project coordinator Guillem Anglada-Escude of Queen Mary University of London, the first hints of this new planet appeared in 2013, but there was insufficient evidence to claim discovery. The latest observation campaign is called Pale Red Dot (because Proxima Centauri is a red dwarf), inspired by Carl Sagan’s famous description of Earth as a pale blue dot. The team of 31 scientists from eight countries relied on the Doppler effect to detect a faint wobble in Proxima Centauri’s spectrum of light, which approaches and recedes from Earth every 11.2 days at around 3 MPH. Such a wobble could be caused by the gravitational pull of an orbiting planet. By combining data from the Pale Red Dot campaign with earlier data collected between 2000 and 2014, the astronomers confirmed a sharp peak—well above the threshold for discovery—in the Doppler shift data indicative of an Earth-sized exoplanet. The technology to detect Proxima b has been around for at least ten years, so why has it taken so long for astronomers to make the discovery? It’s because Proxima Centauri is pretty active as stars go, and its natural brightness can mimic the signal of a possible planet. The team relied on observations with two other telescopes to chart how the star’s brightness changed over time, enabling them to exclude the possibility of a false positive. There is just a 1 in 10 million chance that this signal is a false positive, according to Anglada-Escude. It’s not yet clear whether this new exoplanet has an atmosphere. Because Proxima Centauri is a fairly active star, Proxima b suffers x-ray fluxes approximately 400 times greater than what we experience here on Earth, and this could cause any atmosphere to blow away. But Ansgar Reiners of the University of Gottingen in Germany said that it really depends on how and when the exoplanet formed. Did it form further out, with water present, and then migrate closer to its star, or did it form very close to Proxima Centauri? The former scenario would make an atmosphere more likely. “There are many models and simulations that produce very different outcomes, including possible atmosphere and water,” said Reiners. “We have no clue, but the existence of [an atmosphere] is certainly possible.” That would bode very well for the possibility of the planet harboring life. And the relative closeness to our solar system makes robotic exploration feasible within a generation. Announced to great fanfare in April, the Starshot Initiative is a $100 million research and engineering program seeking to lay the foundations for an eventual interstellar voyage. The first step involves building light-propelled “nanocrafts” that can travel up to 20 percent the speed of light. Such a spacecraft would reach the Alpha Centauri star system just over 20 years after launch. Currently, the project’s scientists are trying to demonstrate the feasibility of using powerful laser beams to propel a lightweight sail. Note: Avi Loeb will be joining Gizmodo today from 2:00 -2:30 PM ET. He’ll answer all your questions about this exciting new discovery, the hunt for exoplanets in general, and the Breakthrough Starshot initiative. Maddie Stone contributed to the reporting for this story.